As the winter sets in desolate Ladakh and the temperature plummets, the Zanskar River starts to freeze. With time it forms a thick layer of ice on it. This is that which is referred as Chadar. 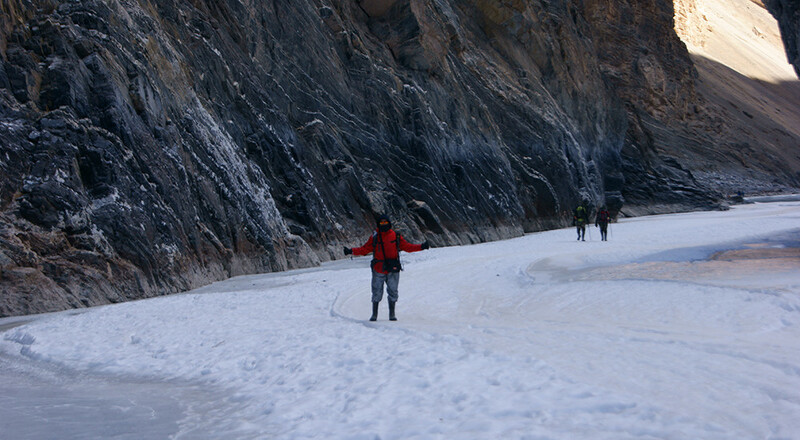 A walk on this frozen river is called Chadar trek. The amazing colours ranging from bluish tinge to golden yellow produced by the reflection of the sky and the mountains on the layer of ice is marvellous. It’s a walk like none other on earth. Zanskar valley lies to the south – west of Leh, surrounded by the Himalaya and Zanskar ranges. Zanskar comprises of two main valleys the Stod(Doda Chu) and the Lanak (Tsarap Chu) the coverage of which starts below Padum. The area remains inaccessible for nearly 7 months in the year. Chadar is more than a trek for the Ladakhi people. It has a history of more than 1000 years.The Zanskari people call it “Khado Sanglam” The Chadar is perfect example of the resourcefulness of the Zanskari people. In winters the Penzi La, which is located at an elevation of 14000 feet gets closed due to Snow. Penzi La is the only road which connects Zanskar with the out side world. The Road starts from Kargil and follows the Suru valley across the Penzi La till Padum. Padum is the Headquater of Zanskar. The Zansar range is high and steep, so there is no route for the people to connect with the other places of Ladakh. 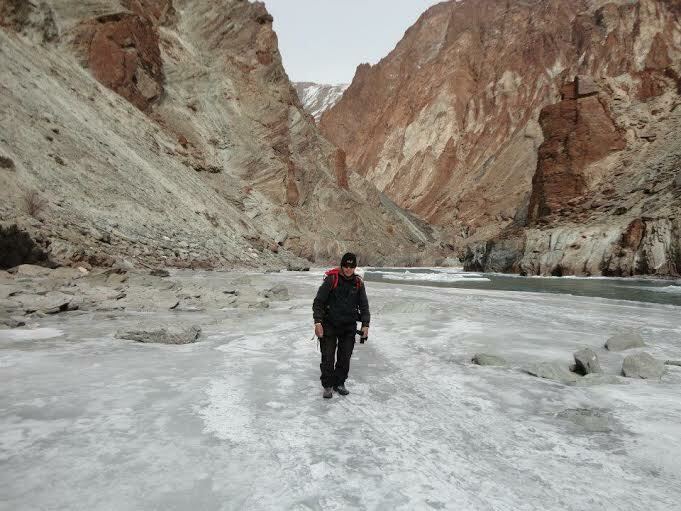 So when the River Zanskar freezes during winters, it forms a layer of Ice of it, which is hard enough for letting people walk on it. The Zanskari people in winters walk on it to reach Chilling, which has an all weather road connected with Leh. This has been a traditional route for these people for centuries. It was part of the Silk Route, and people waited for it to freeze, so they could head back to their homes. Even today this route is used by the Zanskari people to move in and out of the Zanskar Valley to Leh. School children who come to study in Leh, go back home on the frozen River. .1 Rucksack/Backpack of 60 to 70 litres capacity. .2 pairs of waterproof trekking lowers. .Sun Glasses. These are very important. The reflection of the sun rays from the snow crystals can make your face burn and cause a white out condition in which you wont be able to see clearly. If you wear spectacles, please get photo chromatic glasses or get a numbered dark glass made. .Torch or Headlamp with spare batteries. The tour operators have a Medicine Box and First aid kit, but you can keep some tablets of Crocin, Avomine, Combiflam, Brufen, and Norflox . If you think you can have a High Altitude Sickness, you can go in for Diamox on the advise of a doctor. You can carry a couple of knees caps, Crepe Bandages, some anti inflammatory spray or lotion like Moov. Carry a small first Aid kit comprising of some Bandages, Betadine, dettol, and some band aids.
. Some Drinks to enhance your stamina and make up for hydration loss during the trek like Glucose, ORS Salts, or Gatorade. Remove the batteries from the cameras as you finish taking photographs and put them in your pockets. Be careful while changing lenses, as vapour can set in dampening your camera. Thin silk gloves are a great help while taking pictures in these sub zero temperatures. Stay hydrated, take small sips as the water is too cold. Keeping hydrated is the key in high altitudes. The water level in your body helps to force oxygen to your organs, and at high altitudes, there is a greater rate of water vapour lost from the lungs. You don’t feel so cold while walking, because your body is in motion but once you reach a camp you suddenly feel the chill. So keep a warm jacket ready, and put it on as soon as you reach a camp.a walk on frozen slabs of ice. So safety is very important. Please listen attentively to your trek Leader. Never walk in front of your guides. They first check weather the Ice can take your weight or no. Where the Ice is week , an alternate route has to be taken along the mountain. Some times there is hard ice only near the banks, so you have to crawl under protruding rocks. Don’t walk in groups. Don’t stand for long durations in places where cracks are visible. Don’t Smoke or consume alcohol during the trek.It can be fatal. Day 1:-Report at Leh. Acclimatize and over night at guest house. Day 2:-Drive to Chilling [3 hrs]. Trek to Tilat Sumdo camp [1 hr]. Day 3:-Trek to Shingra Korma [9 km/6 hrs trek]. Day 6:-Trek from Naerak to Tibb. Day 7:-Trek to Shingra Korma. Day 8:-Trek to Chilling and drive back to Leh. Drive from Leh to Chilling and Tilat Sumdo. Today in the morning drive with small brief halt at the magnificent confluence of River Zanskar and Indus and then again a drive to the Chilling, one of the most famous villages in Ladakh, known for craftsmanship, especially the metal works. Touching the Chadar first time, we start the trek for 1-2 hrs along the magnificent frozen river Zanskar till Tilat Sumdo. Overnight in cave/camp/tent. 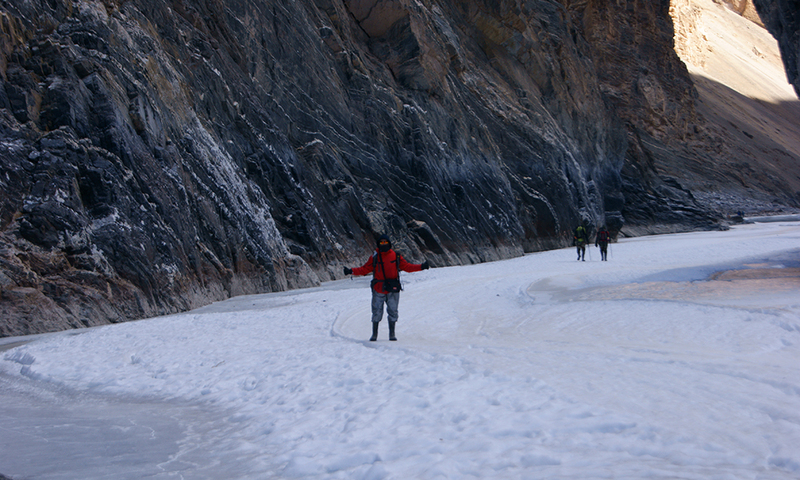 Also learn the fun way to adjust yourself to Ladakhi Shuffle walk style on the frozen slippery ice of River Zanskar. Trek from Tilat Sumdo to Shingra Korma – 6 hours.After breakfast, there will be a quick call for a breifing at 7:30 am and we will depart early. The walk on the Chadar has fully started. Hearing the different sounds of Chadar forming and breaking, you will soon get familiar where the Chadar or the ice cover is thick and thin. You start getting the feel and vibes of Zanskar. In the evening you reach the majestic campsite of Shingra korma. Trek from Tsomo Paldar to Tibb – 8 hours. Three days of walking on frozen Zanskar has enhanced your endurance and taught you how to take a safe fall so that you can ready yourself for eight hours of long trekking.. This day brings out the real adventurer residing inside you for decades. .Though today is the longest day of the trek, we pass through some magnificent beautiful waterfalls and frozen ice cliffs on the left – it is like walking through a giant freezer! The walk also crosses through narrow gorges, where the trekker may have to climb briefly on to the rocky river bank. The sharp bends and current of the river breaks the ice in some places. Lunch in between on a flat rocky hill side by the river. The valley gets steeper and steeper as we move in. 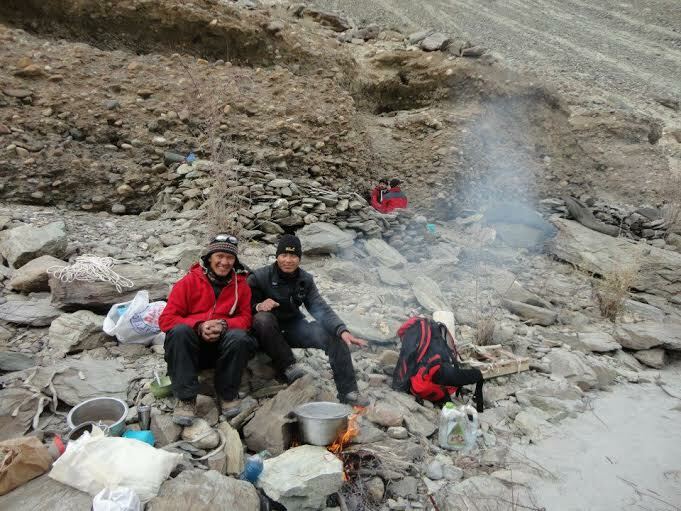 We reach the campsite of Tibb in the evening and camp there. Trek from Dibb to Nyerak Pullu – 7 hrs. Again one of the magnificent days on the Chadar trek. However, the caution being that this can become a difficult if the Chadar is not very firm. The vistas are stunning though as we pass through giant frozen waterfalls, ice cliffs and one may even catch sight of the mountain fox. Nyerak village is located high above. Beyond the bridge that links Nyerak village with Lingshed, small huts mark the summer grazing shelters of the villagers. Trek from Nyerak to Tibb. Though technically it is the same way back, it is also quite different. The Chadar or the blanket of ice that is forming on the River Zanskar is always changing, breaking up and forming itself again. As the Chadar dynamics are ever changing, the same route and place would look and feel different as the texture and conditions change. Trek from Tibb to Shingra Koma. Trek from Shingra Koma to Chilling and drive to Leh.The eighth day is the last leg of your trek. Your wildest walk is about to come to an end as soon as you reach Chilling after walking for a couple of hours from Shingra Koma. We drive back to Leh from Chilling and spend the night at a hotel/ Guest house in Leh. 1.First Aid, Medical Kits & Oxygen Cylinder. 3. Accommodation. Tented or Hotel. 7. Experienced Trek Leader, Guide & Support Staff to Help Trekkers. 2. Normally our company expect to carry your personal luggage on your own, if you don’t want to carry your backpack so you can give it to porter, but you have to inform us in advance and have to pay Rs. 500 /- extra per day per bag.